Let’s face it; our feet are as different as rival siblings. As extremities belonging to motorcyclists, they are trained to perform different tasks, independent of one another, yet bonded to a common purpose—- supporting humans in whatever endeavor we may choose. The left foot is for shifting and lowering the side stand. The right is reserved for the rear brake pedal and kicking tires to check the pressure. Either can help us balance at a stoplight and both must pull duty as auxiliary steering components when we are standing on the footpegs. Armed with this information, BMW has chosen to create a pair of socks as independent yet cooperative as our pedes. When I first tried on my new Roundel branded socks, it took a moment to figure out why they weren’t the same. Were they mis-boxed? One had some sort of neoprene like patch over the toes. Both were artfully marked with padded outlines over the anklebones, shin, Achilles area and at the bottom of the foot. They looked nice enough to wear as leggings, although a bit short for my 32” inseam. And then it dawned on me…the blue toe patch was to pad my toes against the shifter. Brilliant. Wool has yet to be surpassed for its natural climate control capabilities, and these socks have it in abundance. Some 50% of their makeup is from the backs of sheep and laced with other technical fibers to allow them to stretch, to aid in durability, and to provide comfort and protection for long days in tall, stiff boots. 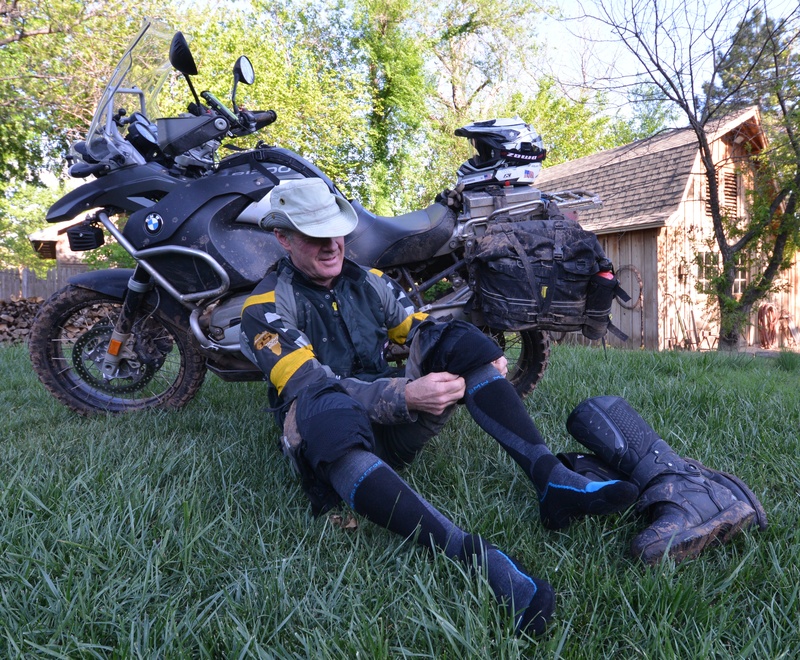 Knowing this, I could hardly wait to pull them on and head for the training grounds where I would not only test my socks, but my self as well, against the ever changing South Canadian River where I would be holding an Adventure Rider Skills Clinic in a few days. “Comfortable” hardly describes how my feet felt when I first slipped my Functional Sock clad feet into my Sidi Adventure boots. Light but firm pressure gripped my lower legs where the padding held the stiff leather away from my ankles and shinbones. I seldom give much thought to my socks, as long as they are dry, but this was nice. It was a good start. The trails were muddy. Putty-like clay stalled the front wheel on my GSA, deep in the woods. Even as I decided this trail would be omitted from my students’ lessons, I floundered and fell. The front wheel was trapped, stuffed with sticks, leaves and muck. A half hour of lifting, sweating and digging had me rolling again, only to find myself wading boot deep in a mud hole. More sweating, lifting and pushing. My socks were no longer dry, but wool, by its very nature, does well, even when wet. Sweat and pond water soaked my feet, but there was no chafing. Finally satisfied that I had mapped out a suitable routine for my students, I hit the Interstate and pointed my toes towards home. High percentage of wool and other high-end materials make for a quality pair of socks. Size 45-48 provides a generous fit for my size 11.5 feet. Special toe protection and thickening at bony and stressed areas feels great. Pricing is on par with other quality brands. You don’t have to ride a BMW to appreciate the quality. You can’t wear them to the gym…or shouldn’t.